Financial companies often need software developers just as much as companies in the tech industry. So what are FinTech roles, how do you find them, and what qualities are those companies looking for in a developer? .NET coding bootcamp Coder Foundry sees many graduates entering developer roles at finance and banking companies. We asked Coder Foundry Marketing Director, Hashim Warren, to explain the FinTech industry, what aspiring developers need to learn to succeed, and how to effectively demonstrate your skills in a FinTech job interview. What is the job market like for coding bootcampers who are studying .NET? .NET is the most in-demand programming stack in America. Microsoft created the C# language and .NET framework over 10 years ago, and have spent a lot of resources to make it popular with developers. No matter what state you're in, you'll find firms heavily using .NET. A lot of large enterprise companies like JPMorgan Chase, Morgan Stanley, and Bank of America have been using .NET and C# since Microsoft introduced it over a decade ago. And that's why there's still demand for it now across different states. You mentioned a number of financial companies. What is the job market like for FinTech developers? We tell students that FinTech is actually a hidden job market. Most people have heard of the B2C technology companies like Apple. However, there are also B2B technology firms selling software that the average consumer won’t know about, like sales software for a brokerage. Those companies need developers too. One example of this is Advanced Fraud Solutions, the company that our founder Bobby Davis created before Coder Foundry. Advanced Fraud Solutions is a FinTech company which uses .NET and C#. They sell fraud software to banks and credit unions. Most people haven't heard of Advanced Fraud Solutions, but according to Inc Magazine, Advanced Fraud Solutions has been one of the fastest growing private companies for four years in a row. In what parts of the country are FinTech and .NET developers in demand? There are three parts of the country where we find a lot of demand for FinTech developers. One obvious place is New York City. The other cities are Chicago, IL, and Charlotte, NC. We did a study of the skills gap for .NET developers where we looked at all the .NET job listings in each area, and how many .NET developers were in that area. We found that the only city where there were enough .NET developers was Seattle, Washington, because every developer there is a .NET developer (probably because Microsoft is headquartered in Seattle). The city with the largest gap between postings and developers, was New York City. That’s why we decided to expand Code Foundry to New York City. When we looked at the open jobs in New York City, we found a lot in the enterprise sector: Columbia University, the NFL, the Yankees, and large billion-dollar companies. Over and over again the companies that came up were FinTech companies, companies buying and selling stock, banks, and AIG. How often do students join Coder Foundry because they want to get into FinTech developer roles? Charlotte, North Carolina is known for banking. At our Charlotte location, we've had students hired at Bank of America, Wells Fargo, and some smaller shops that sell into the financial industry. So we have people working at big organizations, and at smaller enterprises. I expect to see that eventually in New York as our cohorts continue. A couple of our students in the first New York cohort chose Coder Foundry specifically because of .NET, but so far, those students haven't worked in FinTech. We actually recently opened our New York Campus this year, so our cohort just graduated. None of our students who received jobs went to FinTech yet. We had one student who was a trader on Wall Street. She went to a different bootcamp, learned Ruby and did well. She eventually wanted to build software for Wall Street companies, but realized that she needed to use .NET instead of Ruby. So she came to Coder Foundry to further her understanding. For people who are not familiar with FinTech, give us examples of the roles that coding bootcamp grads could apply for in FinTech companies? It's important to understand the different types of companies in FinTech. First, there are large financial institutions that have been around for 80 years. Secondly, there are smaller startups that are trying to disrupt those larger institutions and building new ways to bank or to invest money. And thirdly, there are small consulting firms that are selling services to large corporations. A consulting firm might be building a CRM for traders using .NET because it's custom software for a large corporation to use within their existing environment. Within those three types of firms, the smaller firms want full stack developers – people who can participate in the front end and back end. Larger banks and enterprises might want a full stack developer to work on smaller projects. We see full stack as the standard employers are looking for, but banks often don't need a new developer to build something from scratch like a small consultancy would. When we think FinTech, we think Python! Can a FinTech developer know only .NET or are there other technologies that FinTech developers need to know? It depends on what type of software you're building. The three languages that we find used in FinTech roles are Python, Java, and C#. So if you work at Bloomberg and you're building terminals, you'll find that they use Java. If you're building an application that is related to data science or crunching numbers, you'll use Python. What are employers looking for in a new .NET developer from a coding bootcamp? It depends on the type and size of the organization. Often we find that the bigger brand name companies are more willing to hire more junior students, because they have the bandwidth to train them. If you are brand new to programming and need a job that will allow you to grow, the companies that use .NET in a large enterprise may be the way to go because they are willing to take more junior people who know a different back end language and teach them a new one through their own training programs. In fact, they’ve always had to train new CS grads who often learn Java in undergrad. Now, it's a little different if you work for a smaller consulting firm. Everyone has to be nimble because they don't separate their back end developers from the front end developers. Everyone needs to know how to maintain or build a project from scratch. So we're finding that our best students or our more experienced students will go to those smaller firms and do well there. 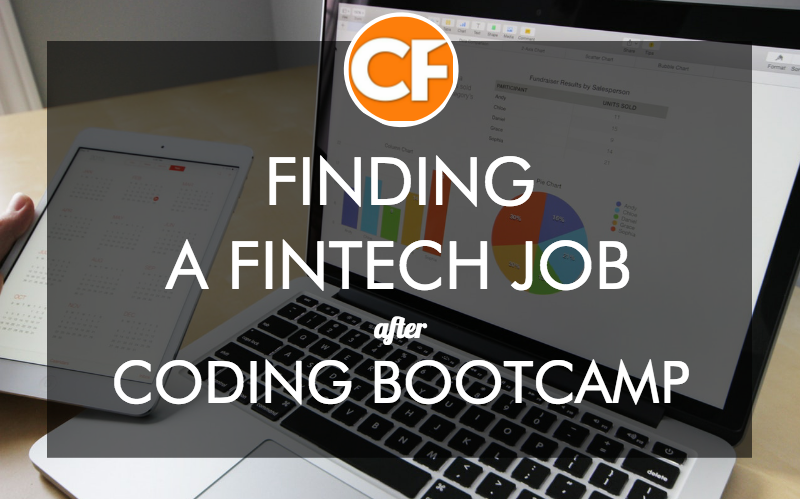 Has Coder Foundry updated the curriculum at adapt to the demand for FinTech roles? We give students a baseline that they could and apply to whatever specific need their job has. There are advantages to the framework we're teaching. Microsoft is enabling C# and .NET developers to build applications using new technologies that are coming out like the Blockchain. So if your job requires you to use a Blockchain for a new product, you can use Azure and their Blockchain service with C# to take advantage of that. If your job is using machine learning, you can use Azure’s machine learning service and access it using C#. Microsoft also recently released a framework where you can build a chat box with voice control which also uses C#. At Coder Foundry we teach students how to build an application, how to use Visual Studio, how to use C#, and how to publish on Azure, so they can take that knowledge and apply it to whatever specific need their job is asking for. Do students build FinTech-focused projects at Coder Foundry? How are these useful in job interviews? One standard project students build is a budget tracker for tracking a personal budget, which can be customized to track a company budget. This teaches you some of the problems that you'll find in any FinTech job, where you might need to build something consumer-facing to help with money management or calculations. We also have students build projects like a bug tracker that might be used within any technology team, including at a FinTech organization. Lastly, students build a Customer Management System (CMS), which is often the main project that someone builds to run a website or something internal. We think these are the baseline problems that you’ll find in a FinTech organization or any organization. And once a student can show they know how to solve those baseline problems, an employer knows that they can do the job. If you are going to a FinTech organization, showing your budget tracker is a great project to share. Or, if you're going to an employer that wants you to build both web and mobile applications, students can show the last project they do at Coder Foundry, which is an iOS and Android application using Xamarin. Is it an advantage for FinTech candidates to have a finance background? If you have a background in finance or banking, it's even better for a recruiter and better for our in-house career staff to place you back in that same company because you know the requirements, you know the language, you believe in the mission, and you can dress the way that they want you to dress. When it comes to actually finding the job listings, where have you found is the most successful place for students to find .NET and FinTech job listings? We tell students to work with third party recruiters rather than wasting time on job posting sites. A lot of NYC and Charlotte recruiters are trying to fill jobs in FinTech companies because those are the companies that are willing to pay a recruiter, and are having the hardest time finding developers. You don't need to focus on FinTech too much; you can just go to a recruiter that specializes in .NET and they will place you in a FinTech role because that's often what’s available. If you’re a student at Coder Foundry, you can take advantage of our internal resources. We have a hiring manager who's been a recruiter for over 15 years, placing people in IT roles and in FinTech companies. So we tell students to work with her to get ready for a job interview and for the chance to get placed at some of the companies in our network. Once a student has applied to a job and landed an interview, what candidates can expect in a FinTech job interview? We see two main things. One is some type of code test or whiteboarding exercise, and the second thing is what we call code trivia – a long list of questions the employer asks. Explain the difference between the while and for loop. Provide a .NET syntax for both loops. The more you can show your portfolio, the more the interviewer forgets about your background if you've worked in a different industry, and the more they forget about flubs in your answers to other questions, making it easier for them to focus on seeing themselves working with you. How should candidates prepare for .NET interviews? We give students a list of questions that they can expect and we also try to prep them on those questions. But anyone can find those questions – if you search on Google for .NET interview questions, you are likely going to get the same results that the employer will ask. We also do mock interviews where we ask you to come dressed for a job interview, and we interview you about your projects and portfolio, and get you comfortable explaining your code. Plus, we do exercises where we give you the list of questions and quiz you on it. Do you have any resources you can suggest for people who want to practice .NET technical questions? If you go to Toptal, they have a list of .NET technical interview questions which is pretty standard. What is your advice to employers who want to hire bootcamp grads for FinTech or .NET roles? Judging a developer based on what they have actually built is a great way of hiring people, and we know they'll have a better time finding qualified people using that approach. Of course, my advice to employers is also to come to Coder Foundry. We can connect employers with not just great developers but developers who have a background in another job that might fit their culture and the workflow that they're asking for. Are there meetups that you recommend in Charlotte and New York City that coding bootcamp students and grads can go to, expand their network, and meet other people in the .NET or the FinTech areas? Some of the largest .NET meetups in the world are in New York City. One that we've worked with in the past, and spoken at, is called the Triangle .NET User Group. or TRINUG. They're a great group of people and everyone there talks about the latest developments in .NET. If you're in Raleigh, they have the second biggest .NET meetup that I’ve found. Coder Foundry also holds regular meetups; our next one is about How to Launch a Coding Career in NYC on July 20. Find out more and read Coder Foundry reviews on Course Report. Check out the Coder Foundry website.